A well-rendered history of the technological and institutional transformations that have made the air a place for ground warriors to fear. “When the first aircraft began to appear in the military forces of the world’s armies,” writes former U.S. News & World Report national security correspondent Budiansky (Battle of Wits, 2000, etc. ), “people saw them with a sort of double vision.” On one hand, the aircraft, rickety and capable of flying only short distances, seemed “as practical or fearsome a weapon of war as a pop gun.” On the other hand, for the likes of H.G. Wells, they offered a futuristic vision of total war, of an apocalyptic time when airplanes could cross huge distances and visit destruction on targets that could not begin to defend themselves. 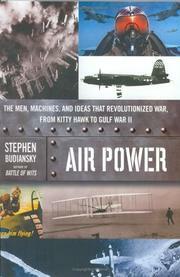 Budiansky keeps this large theme in mind throughout his narrative, which is peppered with fascinating detours into little-visited corners of history: the Wrights’ efforts to sell their aircraft to any buyer who could come up with the cash, including the British government, one of whose officials rumbled, “the prices asked by the Wright Bros. are all out of proportion to the benefits to be gained”; the progress in American aircraft production that came about as a perhaps unintended consequence of the New Deal; the extraordinary, and heavily politicized, air war in the Pacific in the closing days of WWII; Lyndon Johnson’s near-total control of the air war in Vietnam, which led him to boast that the Air Force “can’t even bomb an outhouse without my approval.” Such episodes lend richness to Budiansky’s long rags-to-riches story, which ends with a point taken straight from today’s headlines: on the modern battlefield, air forces have become ascendant—and critical to any victory. Highly readable: a fine complement to Tom Crouch’s recent Wings: A History of Aviation, from Kites to the Space Age (2003), and likely to be required reading at the Air Force Academy in years to come.